Persistence Market Research has come up with a new report titled, “Neuroscience Market: Global Industry Analysis (2012-2016) and Forecast (2017-2025),” to offer a crystal clear picture of market trends and opportunities in the global neuroscience market during the projected period of eight years. While examining this market, we have considered market consolidation activities such as merger and acquisition, collaborations, partnerships, license agreements, patent transfer, which may influence the market growth between 2017 and 2025. It has been noted that currency fluctuations and changing taxation policies would have a significant impact on forecasting of global molecular imaging market over the forecast period. Macro-economic indicators such as neuroscience market outlook, gross domestic product and others has been considered to arrive at the indicated market numbers. Bottom-up approach has been used to assess market numbers for neuroscience market, while the top-down approach has been used to counter-validate the reached numbers for global neuroscience market. Historical trend has been analyzed to track the data. The global neuroscience market report begins with the definition of the market. Relevance and impact of forecast factors is used to estimate the global neuroscience market. 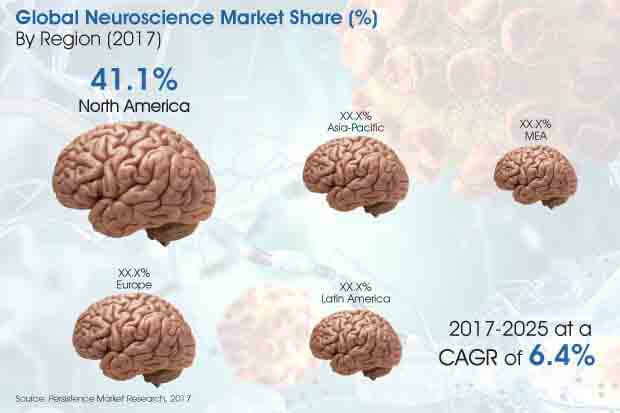 It is followed by an overview of market dynamics which includes Persistence Market Research’s analysis of key trends, drivers, restraints and opportunities which are influencing the development of the global neuroscience market. Impact analysis of key growth drivers and restraints based on a weighted average model has been included at a regional level in the market report after detailed analysis of individual regions to better equip readers with meaningful insights on ongoing developments in the global neuroscience market. In the final section of the report is dedicated to for the detail profiles of neuroscience laboratories which are also included in the scope of the report to evaluate their long- and short-term strategies, key offerings, SWOT analysis, and recent developments in the global neuroscience market. The analysts in Persistence Market Research have performed systematic exhaustive secondary research to analyze the required data points to arrive at the overall market number. The dedicated team for healthcare domain have listed market players across the value chain of technology developers, manufacturers, and distributors. The questionnaires have been developed for each node in the value chain to extract the required market information through primary research interviews. These interviews are conducted using distinguished essential resources. The data which is provided in the global neuroscience market is validated by triangulation method, wherein secondary, primary and Persistence Market Research analysis have contributed to the final data. For the better understanding of the report, the data is represented using charts, info-graphics, and presentation of key findings by region that provides actionable insights and strategic recommendation. Increasing government spending on healthcare infrastructure in developed regions is expected to boost the growth of neuroscience market. As per the centers for Medicare and Medicaid Services, the overall healthcare spending in North America is expected to increase at an average of 4.6% per year during the period 2016–2019. National health spending in the U.S. is projected to grow at an average rate of 5.6% per year due to the large health insurance coverage impact of the Affordable Care Act. As a result of this increasing trend of government spending, the U.S. is going to see expanding interest in overall medical devices, including neuroscience devices in 2017. Strategic acquisitions and collaborations among key players will drive the neuroscience market, especially to develop novel and integrated medical devices and compatible software for MRI and neuromicroscopy devices. The acquisitions and collaboration space is dominated by players who have a strong product portfolio and patented technologies dedicated to and compatible with diagnostic applications along with local GMP certified manufacturing facilities. For instance, in July 2017, Koninklijke Philips N.V. acquired TomTec Imaging Systems GmbH (TOMTEC), a leading provider of intelligent image analysis software to strengthen its business in the software segment. Increasing trade of neuroscience devices and consumables for diagnostics and imaging purpose of brain and nervous system to study of the structure and function of the nervous system and neurological disorders in countries, such as Poland and Russia is expected to boost the growth of neuroscience market in Europe. Moreover, increasing awareness towards the benefits of advanced neuroscience devices, such as combination of other imaging devices along with the MRI and neuromicroscopes over conventional standalone imaging devices is also expected to drive market growth in the region. According to our estimates, the global neuroscience market has grown from a little more than US$ 250 Mn in 2012 to little more than US$ 300 Mn by 2016 end. We forecast that the global neuroscience market is expected to grow from more than US$ 300 Mn in 2016 to more than US$ 520 Mn by 2025 end. This represents a CAGR of 6.4% over the forecast period of 2017–2025. The global market for neuroscience represents absolute $ opportunity of US$ 18.5 Mn in 2018 over 2017 and incremental opportunity of US$ 202.7 Mn between 2017 and 2025. Opto fine Instruments Pvt. Ltd.